Whether advocating for wildlife, tending nature reserves, or guiding field trips, our 140 member groups form a grassroots network through a shared passion for nature. One of the highlights of a visit to Bon Echo Provincial Park, about 100 kilometres northwest of Kingston, is taking the short jaunt on the Mugwump, the ferry that crosses the narrows dividing Upper and Lower Mazinaw lakes. On the opposite shore, you can hike the two-kilometre-long Cliff Top Trail, which brings you to the peak of Mazinaw Rock, 100 metres above the shoreline below, for a panoramic view of the area. A second boat, the Wanderer, takes visitors to the base of the cliff for an up-close look at the more than 200 Aboriginal pictographs that decorate the broad rock face. The tour boats, park gift shop and art gallery are all operated by the volunteers of the Friends of Bon Echo Park, one of the more than 140 groups that are a part of Ontario Nature. 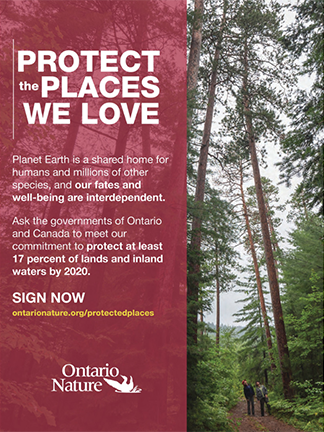 The groups, comprising what is known as the Nature Network, offer participants a range of ways to get involved with the natural environment, from acting as caretakers for Ontario Nature’s reserves to advocating for the preservation of the province’s spaces. The groups also provide an opportunity for people with a passion and concern for wildlife to come together to learn and share their knowledge. The Bon Echo group, for one, is motivated by the desire to “preserve and promote our rich natural and cultural heritage so that it will be here for present and future generations to enjoy,” says executive director Derek Maggs. For example, member groups provide invaluable stewardship for reserves in their area. 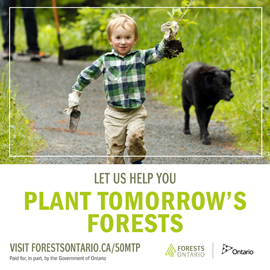 Take the Saugeen Field Naturalists: its 150 or so members have been caring for the Kinghurst Forest Nature Reserve near Walkerton since 1999. The 281-hectare property offers visitors a unique glimpse of what that part of the province looked like before European settlement. The maple-beech forest includes many towering 200- to 300-year-old specimens, as well as vernal pools, cedar-ringed marshes and the rare Hart’s-tongue fern, which grows in this provincially designated Area of Natural and Scientific Interest (ANSI). The Saugeen group is maintaining and expanding the reserve’s trail system, rehabilitating parts of the property that had been developed in the past – including thinning out a monoculture pine plantation – and restoring a cabin that members use during outings to the reserve. Last year, they repaired the deteriorating roof and soffits (parts of which had been munched on by porcupines). Next on the agenda: new windows and siding. Members of the Kawartha Field Naturalists are stewards of not one but two Ontario Nature reserves: the 39-hectare Altberg Wetland and the 470-hectare Altberg Wildlife Sanctuary, Ontario Nature’s largest nature reserve. The latter started with a 101-hectare bequest from landowner Rudolph Altberg in 1983. The club has cared for the property and been instrumental in negotiating and fundraising for two subsequent land additions that have brought the reserve to its current size. Club members have also invested a lot of time and sweat equity in developing and maintaining a trail system through the wildlife sanctuary. For example, they have installed colour-coded markers to help orient hikers about their location in the reserve and have built about 15 metres of boardwalk over some boggy lowlands. As well, the group recently expanded the site’s parking lot and is enhancing signage to encourage more visitors. To keep the Altberg Wetland Nature Reserve as pristine as possible, the club opted not to develop a formal trail system through it. Members do visit the wetland – often joined by students from Fleming College’s School of Environmental and Natural Resource Sciences in Lindsay – but it can be a tough slog. “Sometimes you are up to your waist in water,” says Eric Davis, chair of the club’s wetlands committee. But those visits are important both for conducting wildlife inventories and for site preservation: recently, club members discovered – and removed – a hunting blind illegally installed on the property. The issues and concerns of one naturalist group are likely to be shared by other groups. Since the original seven clubs formed the Federation of Ontario Naturalists (now known as Ontario Nature) in 1931, the Nature Network has grown to include more than 140 associations. And there’s always room for more. If your group is interested in joining the Nature Network, applying takes just a few keystrokes at ontarionature.org. Membership affords clubs numerous opportunities to network with like-minded individuals and pick up valuable advice, as well as benefit from Ontario Nature’s expertise in conservation. 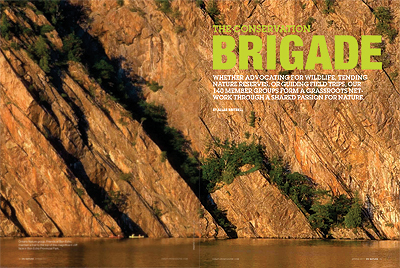 Member groups also receive complimentary copies of ON Nature magazine, and may enter nominations to the Nature Conservation Awards, and can take advantage of group rates for liability insurance. For all this and much more, annual dues for clubs with fewer than 100 members are $75. For student groups, the fee is $40.